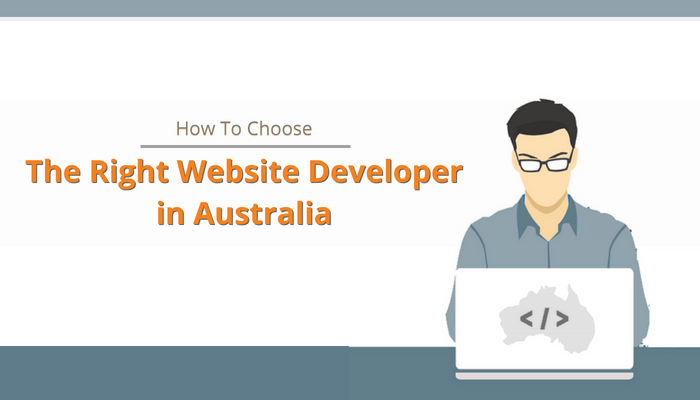 How to Choose the Right Website Developer in Australia? A business website is often the gateway to its prospects forming their first impression of the organization, and choosing the best website developer helps you to grab the attention of your potential customers. First impressions always matter and have critical implications in terms of final business outcomes. With human attention spans dwindling to levels lower than that of a goldfish, it’s imperative that a website is well endowed in terms of being both attractive and functional, so as to attract and retain its targeted visitors. What Make a Good Website? Good websites are not just visually appealing but are also intuitive and easy to navigate for their visitors. Needless to mention, unless the website performs well on the SERP, it can hardly gather any organic traffic. Good websites strike a balance between aesthetics and functionality with well-executed backend technicalities. The best websites come as a balance of all these, combined with powerful messaging in order to compel people to visit and register themselves as qualified leads. Realising the advantages of owning a website or ensuring that the existing one lives up to the modern standards, almost all business including startups desire to own a good virtual real estate. If you are looking to build or revamp your existing website, it’s understandable if you’re confused whether to pick a DIY theme or go to a freelancer or spend what it takes to hire an established company. While it’s most tempting to pick DIY themes or freelancers due to their apparent cost advantages, picking a company to execute the job is most often the right decision from a long-term viewpoint. DIY themes are essentially set templates that allow customization only to a limited extent. Moreover, with only taking care of layout, the other aspects such as content, designs etc. increase your work burden extensively, which more than makes up for the saved money by consuming a lot of time. These limitations get reduced with a freelancer. 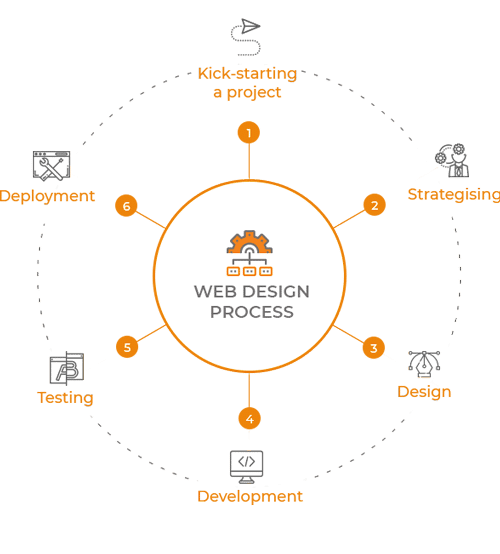 However, even they aren’t experts to handle all aspects in the lengthy process of building a website, spanning development, design, content etc. In that sense, companies are best equipped to take care of all the stages with the requisite expertise. Additionally, since the website is the first step towards online presence, with ancillary procedures such as SEO and online marketing to follow, having a single destination to take care of it all right from the start makes it efficient and economical both with a pre-agreed package. Moreover, a company with good knowledge can implement an SEO optimized code right from the start, laying an optimal foundation for your web presence. The foremost thing you should check is the service area of a company. You must know which part of the industry, they majorly serve like startups, SMEs and large organisations. Being a startup, SME or other, you ought to hire a web developer who has extensive experience in an industry similar to your niche. What’s needed in the website of a small business or a startup is completely different from what would be required in that of big and established company. The type of functionality, features and even the design presupposes a different approach. Additionally, you also need to check if they have an understanding of your niche and can create something meaningful for your targeted user persona. Naturally, the strategic approach, appropriate CMS and expertise needed for a fashion e-commerce store would be very different from a B2B information-oriented website and it’s important to pick the company that understands these differences. Only then, can they successfully design a website that is a real lead magnet for you. Hence, prior to finalizing, you must check the company’s service area and pick one whose expertise overlaps with your requirements. A good place to ascertain that is by scanning their portfolio and gathering a real insight into their clientele. Discussing with their business development executives about their past client concentration and starting ideas about building your website also helps to gauge this. With the long-term investment angle in your business website, you must make sure that you’re trusting only an expert in order to generate the highest returns over time. Often, impressive salespeople make their companies sound like your best choice, but it is their website that gives away the truth. It’s advisable to examine the messaging on the commercial pages of their website to ascertain their expertise. You may review if their approach is based on psychology backed strategies and execution as per the latest standards. 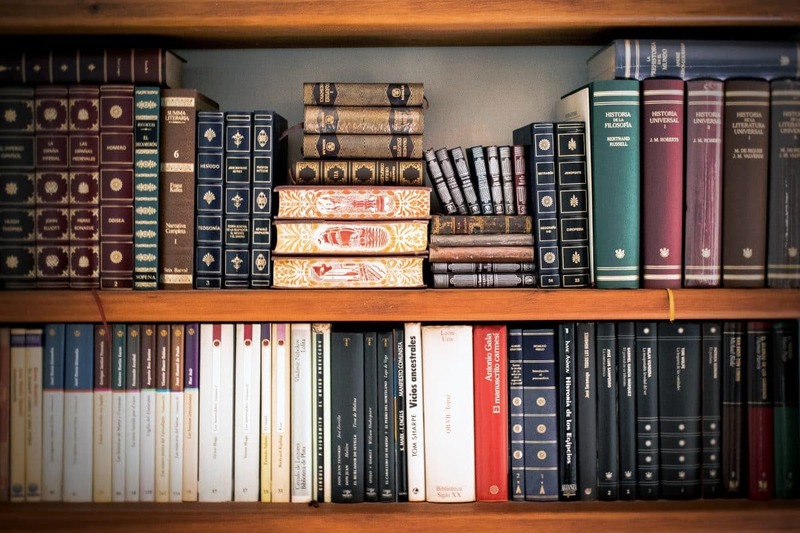 Additionally, you could also examine their blogs to assess their domain expertise, for true thought leaders in any industry never shy away from sharing the depths of their knowledge. Make sure whichever platforms and technology they showcase, they should have specialised and dedicated teams to work on these. If you already have a specific platform in mind for your web development project, check their respective landing page based on such platform. Most preferred platforms include WordPress, Joomla, Drupal and Magento. Once you feel sorted about the specialisation and expertise, the next step is to ensure they’re reliable. After all, the company must be dependable to be delegated to your business projects. Understand it by looking for the information on their website pertaining to the number of years of operation, existing client base and the depth of their portfolio. You can do a quick Google search to learn about their reputation in the region. You may check out their company reviews, go through recent testimonials and examine their social media handles. Most people often narrow down the companies they approach based on the references they get from their personal network. However, a more reliable approach is by looking through the reviews and ratings, whether they’ve received awards or recognition for their work. In order to build a good and optimized website, there is a certain mechanism that must be followed such as planning a strategy, developing the intent-based aesthetics and messaging, executing the backend, coding, testing and so on. When choosing your web developer, you must learn about details of the processes they follow. You can check their website for this information or alternatively ask for brochures or ebooks. Going through the brochure is very helpful to provide you with all the information you need in a single place to have a quick understanding of their overall brand, expertise, reliability, and processes. While it can get tempting to outsource your website work to freelancing portals or to overseas locations with clear cost advantages and not needing to meet or talk except a few times via messages. 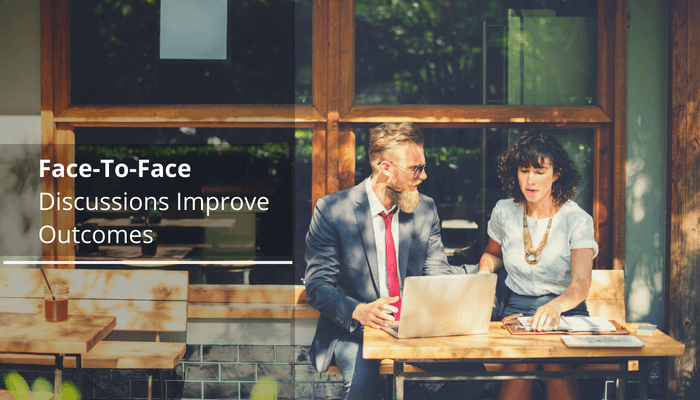 Although, it’s much beneficial to go for the ones with whom you can have a face-to-face conversation at a physical location. Real discussions, in a workshop arrangement, help to define the scope of your project and its specific requirements in detail. So, don’t hesitate to ask for a workshop. 1. Details on their intended strategy to attract visitors and actually engage those visitors on your website. 2. 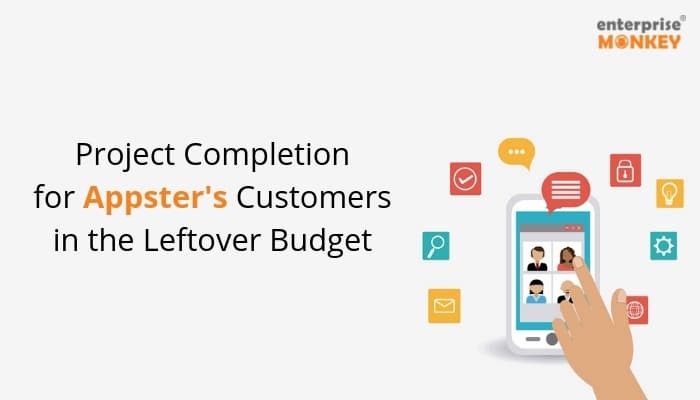 Learning about their lead generation plan for the website and its actual measurement & analysis process also helps to gather a good idea of their level of thoroughness. This way, by discussing all these things at length, you can successfully ascertain if their service will add value to your business and improve your revenue models or not. Additionally, you may also judge the company and its representatives by the type of questions they ask you about your business to recommend your website specifications and how they run you through their existing portfolio or explain their starting ideas. If you don’t have your project delivered at the right time, it definitely calls for losses in terms of missed-out business opportunities. It’s best to ensure from the start that the company is accountable in terms of the deadlines it proposes and also is asking for a turnaround time suitable for you. In order to avoid delays, it’s best to work with one that is willing to define timelines for each milestone and keeping you in the loop at all the times. This has the additional advantage of ensuring that they’re actually accountable for following all the right steps. The cost of building a website varies greatly, depending on the developer’s expertise, experience and also the level of customization your project require. While using pre-set themes are extremely economical, customization comes with its own advantages and proportional costs. When you build your website in a budget, it’s important to make sure that you don’t cut out on the features you need and end up compromising where it matters, since it is a long-term investment. In order to ensure your project doesn’t overshoot the initially agreed commercial with the company, it’s good to hire one that actually helps you pick the right features needed for your website right from the start and is also transparent with all the associated costs. These days, some web development companies often provide their potential customers with a cost calculator on their website in order to keep the pricing transparent with no unpleasant surprises unrolling later in the form of hidden costs. You must look out and explore such features. During the development process of a website, there are different iterations introduced from what was discussed in the first meeting. Even if there aren’t iterations, there is continuous back and forth interaction needed to fixate aesthetics and content. 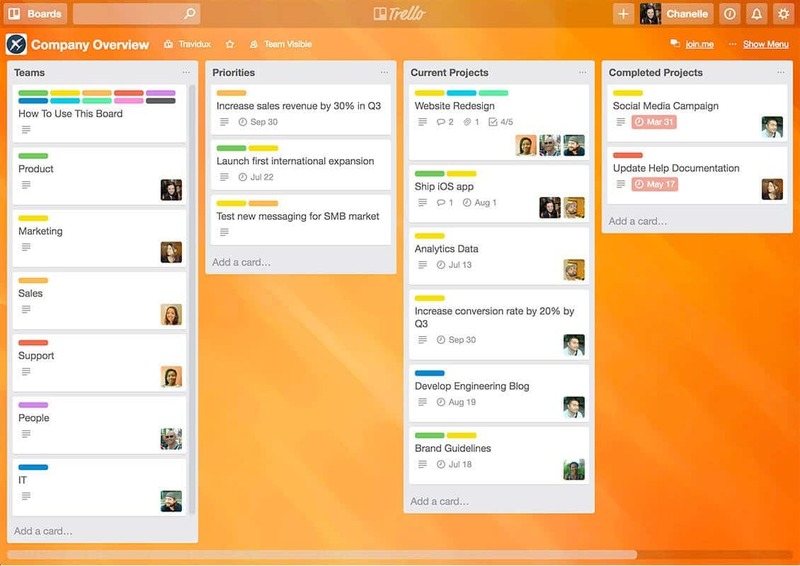 This calls for seamless communication and task management. The good project management tools ensure that the major concerns are not missed out or are subject to unnecessary communication gaps. You must ask your developer if they have any measures in the form of popular and easy to use tools such as Slack, Trello, Jira, Skype and many more, so as to ensure that your project is smoothly executed with uninterrupted communication at all the times. Managing and maintaining any website calls for the need for support services for many of its functionalities over the long term. These could be pertaining to say your e-commerce set up, or renewing your domain and hosting or personalized email accounts. While choosing one’s web design company, it’s absolutely vital to pick one that offers genuine support on an ongoing basis. Without good after sales support, one can end up in a fix with the need of hiring an additional external developer that calls for unnecessary charges of its own. Besides the cost, the extra time it takes to get these things in order can get extremely obnoxious. Hence the support aspect is critical and whichever company you choose must be accountable with predefined support and maintenance for at least a few months in their initial contract. In fact, one of the biggest reasons why it is advisable to go for a company over a freelancer is the fact that freelancers tend to avoid the support part once their project is completed. They usually work on a few projects at a time, and reworking on completed projects turns out to be financially unviable for them. This makes it very hassling for the website owner to manage their website in the long term. You must make sure that the company hands over the complete website ownership to you. Often, there are some small changes needed to be made after a few months of your website launch, that can be executed internally. For instance, changing the content on some of the pages after support has expired. In those cases, having to pay additional charges for small tasks frequently makes no sense. Alternatively, if you feel the need to change your website developing partner in the future, your needs may not be big enough to require a revamp from scratch. Hence, in order to ensure that you’re not forced to depend on that company in future, it’s best to confirm in advance if they handover the essential login credentials and the source code for the website. The decision of picking a web developer for your company website is an important one and does require some careful deliberation. After all, a website is a long-term investment to generate leads and build a certain revenue stream for your business. If you are into a business that will need allied service moving forward in the form of SEO, SMM and so on, it’s best to work and establish working comfort with a one-stop company right from the start. 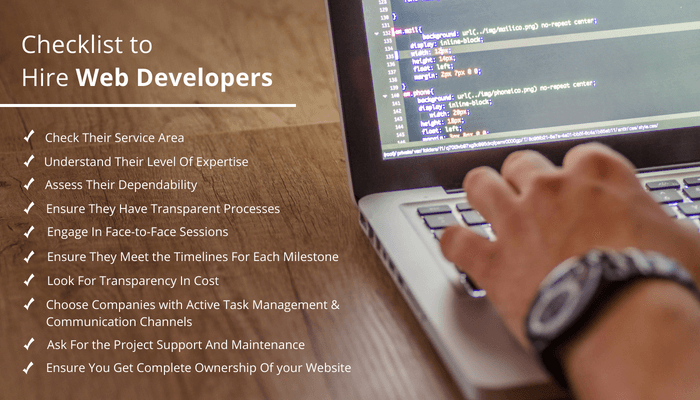 In order to pick the optimal developer for your business, it’s good to first narrow down on your needs and suitable timeline. It’s good to approach companies who are experts in designing websites for your business niche and are ready to work in a reasonable budget. What Questions Should I Ask my Web Developer? 1. Automated Malware Scan – Need to have website scanned for malware automatically each day. If an issue is found, an email should be sent with the details. 2. Google reCAPTCHA – Protect your site against spammers. 3. 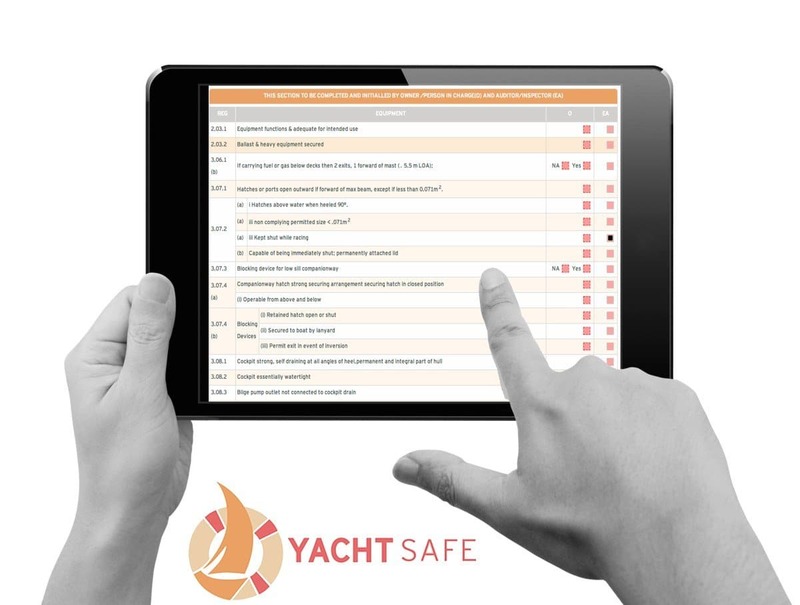 User Action Logging – Website needs to track and keep logs when users edit content, log in or log out. i. Brute Force Protection – Limit the number of failed login attempts allowed per user. If someone is trying to guess your password, they’ll get locked out after a few attempts. ii. File Change Detection – Get email alerts showing any recent file changes so you know if you’ve been hacked. iii. 404 Detection – If a bot is scanning your site for vulnerabilities, it will generate a lot of 404 errors. A website should lockout that IP after the limit you set. 4. Two-factor authentication – Website should have two-factor authentication enabled to ensure security. 5. WordPress file directory access for the public should be prevented. 6. Wp-Config file must be protected. 5. The robots.txt file should be present and enabled. 6. Images should be compressed and optimised. 8. Meta titles need to be only 55 characters long. 9. Social Media Integration must be done correctly. 10. Google Remarketing must be enabled during the initial phase. 1. Ask for a separate development and live environment setup. 2. Ask for a complete visibility of website progress real-time. 9. The website should achieve Google Speed Score of at least 70. Ideally, if you’re located in Australia then you must approach a reliable and accountable company based in Australia itself so that you gain the advantage of having face-to-face discussions for best outcomes in terms of strategy and planning.